KPI provides a host of services that enable organizations to upgrade to Amazon Web Services – a fast, scalable, fully managed data warehouse designed and architected for cloud infrastructure. KPI Partners is a Gartner recognized consulting and Product Company with in-depth expertise in BI Analytics & Data Warehousing. 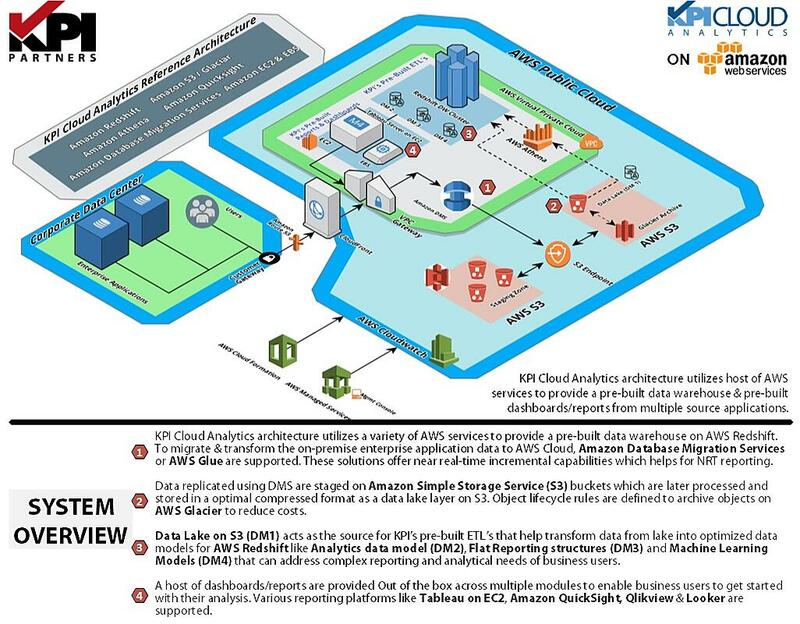 KPI helps to create secure, high-performing, resilient, and efficient infrastructure for your applications and provides a repeatable and consistent approach to building and operating workloads on AWS, modernize company's database extremely quickly and at low cost, while preserving their investment in their existing systems. KPI Cloud Analytics for Amazon Web Services works with various source systems including Oracle E-Business Suite, Oracle Fusion Cloud, Oracle HCM Cloud, Oracle PeopleSoft, Oracle JD Edwards, SAP, NetSuite, and Salesforce. KPI’s cloud experts use proven methodologies to assess your organization’s cloud readiness and accelerate your organization’s migration to the cloud. With more than 500 successful BI implementations, KPI has diverse experience in building robust architectural designs that can scale and meet the expectations of growing businesses. Whatever your business goals – high-availability, scale, compliance or cost-control, KPI’s certified AWS experts can migrate your data and applications seamlessly, within agreed timelines and budgets, ensuring optimum performance and security. KPI has delivered some of the most complex BI deployments in the industry with best-in-class BI architects and solution experts. We have deployed BI tools like QuickSight, Tableau, QlikView and others on Amazon Redshift. KPI provides on-going monitoring, maintenance and support of high-performing managed enterprise data lakes and analytics sandbox environments. After your solution is live in a production environment, our AWS trained and certified team can provide support of your AWS hosted solution.